A revolutionary flash card application for Android devices. Many aesthetic and functional features set it apart from other flash card programs. Operation is simple and intuitive, and color customization creates a personalized experience for users. A valuable tool for students, educators, and parents. 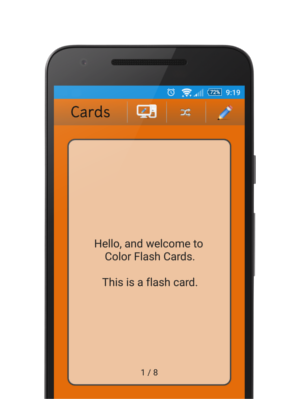 Color Flash Cards is offered free of charge for Android devices. We sincerely hope you enjoy using the app! Please let us know if you have ideas to improve it. Share your deck with friends using a QR code. Create and edit your decks on the web from your computer. This allows you to quickly build and modify decks without being stuck on the tiny phone keyboard. Use the shuffle button and temporary delete feature to narrow your studying to the cards you need to work on the most.